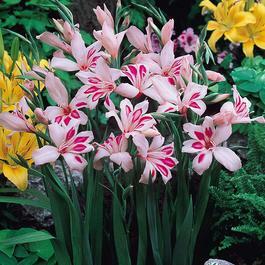 A vibrant, exciting and hugely popular Guernsey Lily, producing dark rose-pink flowers with unusual crinkly petals. A superb perennial bulb that looks amazing grown in patio pots and containers, or within a modern cottage border display. Height 50-55cm. Flowering from September to October each year. Apply a winter mulch to help protect against extreme winter frosts. 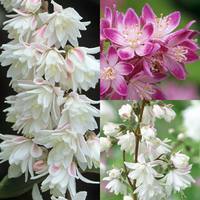 Top quality 12cm+ bulbs supplied. How Supplied 12cm+ bulbs supplied. Planting Plant with the top of the bulb just below ground level. Plant with the top of the bulb just below ground level. 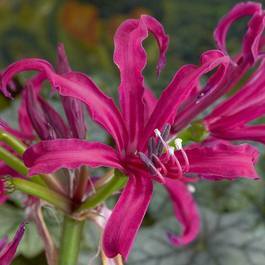 Nerine prefer to be planted in a sunny position, in fertile/well drained soil (with plenty of peat/sharp sand). Nerines are ideal for potting up and can be introduced to the garden in April. 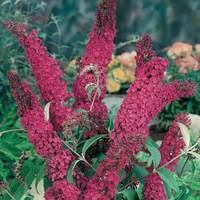 As they are not completely hardy, we recommend to plant in pots, keep in frost-proof place and remove in to the garden in late April. 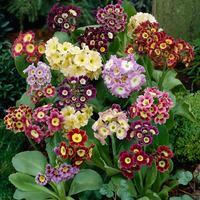 Can be watered freely when growth begins to appear but should be held back when the bulb is dormant.